One of the things that makes Portland unique is the fact that it’s split up by two rivers and fifteen billion bridges. The rivers divide Portland into an east side and a west side while Burnside Street divides into north and south – making five quadrants. Wait. Five quadrants? How is that even possible seeing as how, by definition, a quadrant is one of four? You’ll discover that what Portlanders lack in math skills (and, often times, common sense), they make up for in eclectic lifestyle preferences. The quadrants are simply named as followed: Northwest, Northeast, NoPo (Northern Portland), Southeast and Southwest. I’ve had the unique experience of living in almost all of them (and more) within a 3-year time frame, and Northwest is my personal favorite. Now, in no way am I trying to disregard any of the others (except for maybe the overrated and highly odoriferous Southeast which is filled with slackers, hippies, and, worse, Reedies), Northwest just happens to be where I spent the most time when I first moved here. Northwest is everything east of 25th Avenue, south and west of the Columbia river and north of Burnside St. It encompasses the prestigious, pretentious and snobbish NW 23rd Ave, the less exclusive 21st Ave, the Pearl District, Forest Park, Chinatown, Old Town, Powell’s Bookstore, Henry’s Bar, Ringside Steakhouse and numerous other restaurants and stores. To truly get a feel for the Northwest section of Portland, I recommend visiting in the springtime – if you can find such a thing in this town. I had the luck of spending three weeks in the spring in Portland before I moved here wandering the streets of Northwest, sipping coffee at the innumerable coffee shops, eating at the amazing restaurants and just hanging out watching the world pass me by. Sitting outside a coffee shop on 23rd avenue will give you front-row seats to some of the wealthiest people in Portland. Impossibly beautiful residents will walk up and down the sidewalk, noses held high in the air (as seems to be required on Portland’s Rodeo Drive equivalent) often with bags from Pottery Barn or one of the pricey boutiques that line the street. As pedestrians stupidly bravely cross the street without hesitation or looking either direction, you’ll notice cars of an ilk not typically aligned with a city that welcomes all comers. Lamborghinis, Ferraris, Lotuses and other $100,000+ sports cars are not uncommon at all during a sunny day. Being a car fanatic, seeing three Diablos cruise down the street back-to-back makes me giddy as all get-out. 23rd Avenue is part of the Alphabet District: east-west running streets are named alphabetically. This technique makes the area easy to navigate as even students in Portland’s public schools can learn that Burnside is south while Thurman is north. Fans of The Simpsons by Portland native, Matt Groening, can recognize that he got inspiration for a few of his characters names from the streets in this area: Flanders, Lovejoy and Quimby, just to name a few. After having coffee or a bite to eat at Pepino’s Mexican Restaurant, San Sai Sushi, Blue Moon, Cha or any of the other mouthwatering restaurants in the area, take a walk westward on the unassuming Pettygrove street and visit Wallace City Park. Portland is home to a huge number of gorgeous grassy knolls sprinkled liberally throughout the city. 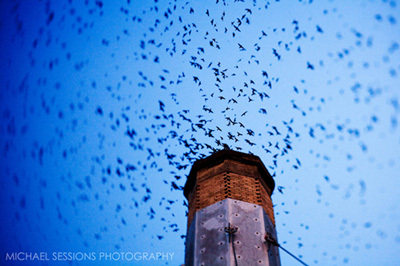 Wallace City Park, however, finds itself home to a special chimney connected to Chapman Elementary School where tens of thousands of small birds called Swifts will stop for a few days as they migrate through the Portland. The birds sleep perched on the vertical insides of the chimney, and, when they return at night, they take turns entering the chimney. The others circle like delayed airplanes at the airport in the middle of a snowstorm, and their circling creates a vortex of small birds swirling down the drain of the chimney. Feeling particularly outdoorsy? Head up Thurman St. to Forest Park. At over 5,100 acres, Forest Park is the largest, forested natural area within city limits anywhere in the United States. Though there are entrances all over, Thurman St. has at least two worth checking out; one at the bridge overpass and one at the end of the street. Hungry for something substantial? Head into the Pearl District; an area of Portland that used to be made up of metal shops and factories that has now been transformed into one of the trendier (for better or worse) places in Portland. Though the Pearl is home to major chains like Whole Foods Grocery and P.F. Chang’s, you can also find restaurants that are distinctly Portland such as Henry’s 12th Street Tavern which has a kickass happy hour. No trip to Portland would be complete without visiting Powell’s Bookstore. Epic does not begin to describe this store – 68,000 square feet, over 1,000,000 volumes, and 6,000 daily visitors. Don’t get me wrong, I truly love Amazon.com, but there’s something magical about entering a multi-level bookstore that carries almost anything you can imagine, old and new. Give yourself a special treat and check out the Rare Book Room (check the website for hours, but you’re virtually guaranteed access between noon and 6pm any day). Head further into downtown and check out Chinatown, home to Ground Kontrol – an old-school arcade filled with pinball machines and vintage arcade video games which, of course, serves beer. Around the corner is Old Town Pizza, and, a few blocks away, Voodoo Doughnuts (though that’s a different quadrant for a different post). If you’re looking to rent or own in Northwest, be prepared to pay up. Residential space is extraordinarily limited, and you’re far from the first to have the idea to live in such a vibrant part of town. That being said, there are numerous apartment buildings and unique living situations to be had. I lived in a basement apartment for a year and a half on Pettygrove that was within direct view of the Swifts’ chimney; be patient, regularly check Craigslist and be prepared to jump on vacancies instantly as they become available. Northwest can be best described as one of the more refined of the quadrants, which probably makes it more readily identifiable and comparable to other cities. When I dive into the other quadrants in later posts, we’ll see why Northwest is only one of many diverse neighborhoods that makes Portland the city it is.